I had a totally different recipe planned for you today. On the menu was a Tuscan flavoured soup with white beans and chicken, but all of a sudden on a chilly day I was overcome with a desire for Tomato Macaroni Soup. I don’t know why, really. All I know is that it brings back memories of high school. I liked high school. I was lucky to have some really great friends, was pretty good in my classes and had coaches who, for some reason, allowed me to pretend to play sports along with those friends. I’ll admit, I’ve never been much of an athlete. I wanted to be good at sports, because my friends played sports, and it seemed like it made one really cool and popular. I struggled through a year or two in every sport, and this soup brings me right back to the school canteen on tournament weekends. Eating at the canteen just wasn’t something I did on a regular basis in school. I always had a packed lunch with my mom’s famous buns and chocolate chip cookies — and I never had extra money to spend. Tournament weekends were different though — and I got to indulge in my favourites: Tomato Macaroni Soup (yes, I’ve always been a soup lover! ), chicken fingers, chocolate milk, Ruffles All Dressed chips. The dinner of champions! You’re a soup lover, too? Try some of my other favorites –> Lightened Up Slow Cooker Cheeseburger Soup or Slow Cooker Garlic Parmesan Chicken Stew. 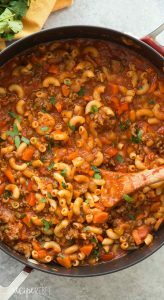 Admittedly, my version of Tomato Macaroni Soup is a little like stoup, but if you find it too thick feel free to add more liquid to thin it out a bit! What are your favorite childhood foods?? I would love to hear! 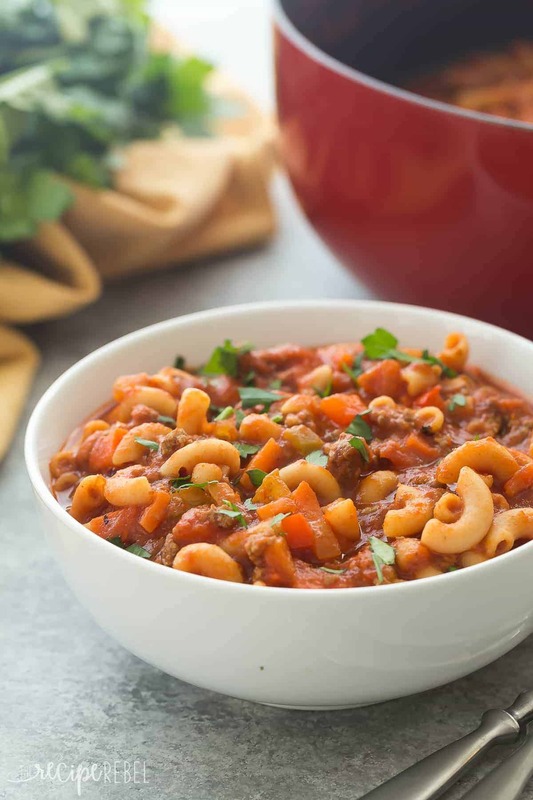 This One Pot Beef and Tomato Macaroni Soup is a classic! It's a healthy, one pot meal made in 30 minutes or less and loaded with vegetables. In a large pot, cook ground beef and onion over medium high heat just until browned, about 2-3 minutes. Add carrots, celery, red pepper, garlic, salt, oregano and paprika and cook until vegetables are tender, about 7-8 minutes. Add broth, crushed tomatoes and pasta and bring to a boil. Reduce heat to medium and cook just until pasta is cooked, about 6-7 minutes. Serve. *NOTE: Nutrition information is estimated and will depend on exact serving size, types and brands of products used. 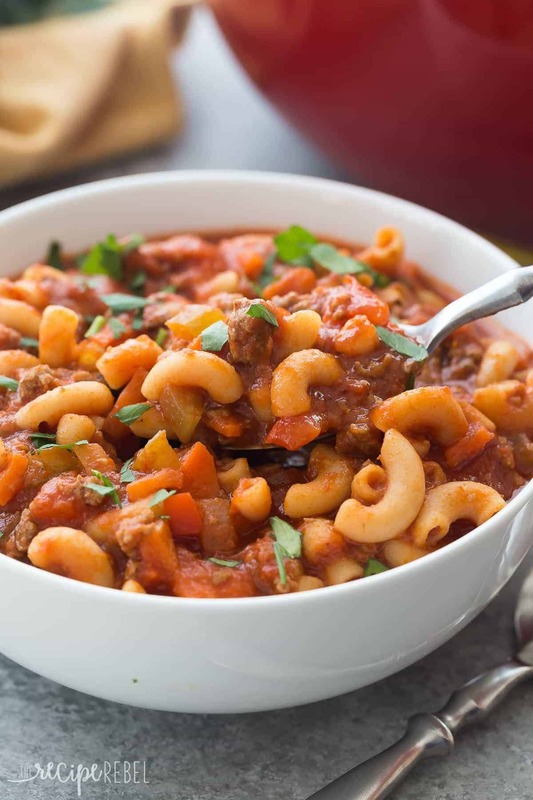 This One Pot Beef and Tomato Macaroni Soup is a classic! It’s a healthy, one pot meal made in 30 minutes or less and loaded with vegetables. And because it’s the first Thursday in March, it’s #30MinuteThursday today! Some friends and I have rounded up the best 30 minute meals on the web. Check them out below! It supposed to be sugar free yet it reads 6 grams of sugar?? Have you tried this in the instant pot? I would love to try it both way’s. I haven’t, but I think it would work perfectly! Ok so what if it’s mid July? This soup looks amazing and I want some. LOL It is stormy right now in the southern half of Indiana, so I think that justifies soup. I’ll just tell everyone I’m testing it for fall. Oh I like that idea! 😉 I hope you enjoy it! I am going to try this soup soon and if i want to taste more spicy, is it possible to season chilli power? 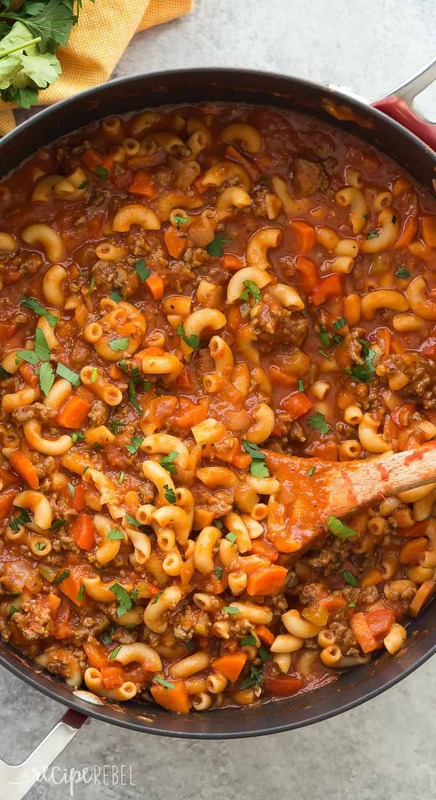 I have never had macaroni soup – but it looks pretty amazing! Super cold and snowy here today so I’m kinda craving this now! Hahaha! The food processor is so awesome for grating veggies! It makes it so super quick. I’m so happy to hear you’re enjoying what you’ve found here! This looks delicious! I would totally go for this on a chilly day too! I love that you looked forward to the weekends so you could have this soup, haha! Lol! Those were pretty rare weekends, but even still — it was a pretty big deal to eat at the canteen! Haha! It is COLD here now but supposed to be warm again this weekend. I totally hear you on the crazy weather! It’s still cold here, so this soup looks like the perfect way to warm up in the evenings! Love hearty soups like this! Your high school days sound fun, and aren’t food memories the best kind? This soup definitely looks like something I would crave on a regular basis, and we never had soup like this at our school canteen! You know I don’t even know how much we did either, I think anything with macaroni just reminds me of childhood! Love the video, Ashley! This soups looks so cozy. It’s definitely still Winter over here, so I’m still loving all the soups. And I wasn’t much for sports either. I was definitely more of a nerd! Lol! Lol! I was totally a nerd, too. I only tried so I would fit in somewhat with allllll the other kids! Now this is my kind of soup! I haven’t had a version like this in years, and now I’m totally intrigued! What a great way to bring back memories of high school, too. It’s cold here today, so I just want to dig into this deliciousness! There is something about macaroni soup that just makes me feel like a kid again. It’s one of our favorites!